Group the report by Supervisor for a report which breaks down the status report by Supervisor. This allows you to get a list of the training status for all of the supervisor's direct reports with full detail (List) so they can follow up with them, or as a Summary to compare the percent training compliance for all Supervisors across the organization. When preparing to schedule a training course, you may want to see a full list showing the training status for the course. Group the Required Training List report by Course to get the full details, or to prioritize which Courses should be scheduled, use the Required Training Summary report and identify the Courses which have the most out of compliance training. 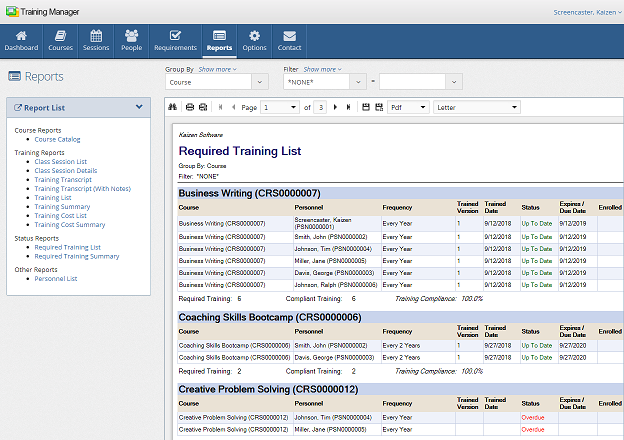 Need to provide all the employees with a report showing the current status of their training? Group the report by Student. You can also group the reports by: Category, Job Role, Personnel Location, Personnel Group, Shift, or Status. Filter the reports by Course to include the data for a specific course only. Need a list of training that is about to expire? Filter the Required Training List report by the "Expires/Due Date" to include training that is either Overdue or will expire within the next 30, 60, or 90 days.